When Your Bridal Dress Is Too Small What Do You Do? "Your gown is so small . . . that you canâ€™t zip it all the way up." "Or it is so big . . . that it hardly touches your body anywhere." How will the problem be handled? 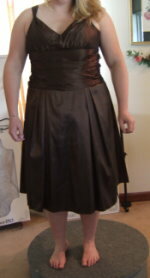 formal dress that was 4 sizes too small! If Your Bridal Dress Is Too Small . . . Most bridal gowns can be let out one size from the seam allowance in the dress. If there isnâ€™t enough seam allowance, then gussets will have to be added to the gown. Gussets are panels that are added to expand a garment in a given area. In the case of a bridal dress... these panels are usually placed in each side seam under the arms. The gusset is shaped like a wedge with the wide end of it in the area that you need extra room. To make gussets inconspicuous . . . â€œyou need to find fabric that matches exactly.â€� Usually fabric can be used from scraps left over from shortening the hem of the dress. Also you can use fabric from the wrap that comes with the gown. Otherwise, you will need to go to the fabric store to find the closest match possible. All details on the gown will have to be duplicated in this area to blend in. So if there is trim, tucking, ruching beading or lace on your bridal dress near the side seams, then the gussets will have to have the same done for it. Also the lining, underlining, and inner bustier if one is present, will have to be expanded on the inside. 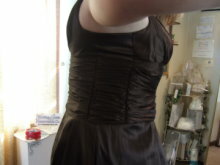 One thing that could be done in some cases is to convert the back into a corset laced opening if a zipper is present. This will work for some bridal gown designs very well. If Your Bridal Dress Is A Bit Too Big . . .
Having a bridal dress that is too big is an easier adjustment to do than expanding one. But this still can involve a major cut down of a gown. Just be aware that you can only cut down a dress so far before it begins to distort the design and shaping. In both sizing up and sizing down you are limited by the design of the gown. I have successfully taken a size 12 to a 24 and a size 18 down to a size 10. These cases were not the usual. The design of the gown in each case worked well for this amount of change. 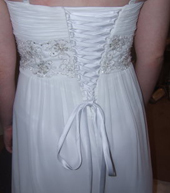 But not every bridal alterations seamstress can do this. You need someone with a lot of experience in doing this..
Preferably, one who has designing and dressmaking experience. These skills are especially needed when doing major size ups and cut downs.